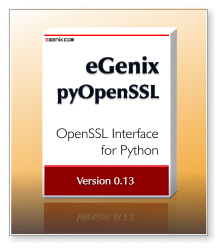 The eGenix.com pyOpenSSL Distribution is an easy to deploy repackaged version of the pyOpenSSL Python interface to OpenSSL. pyOpenSSL is an open-source Python add-on that allows writing SSL-aware networking applications as as certificate managment tools. It uses the OpenSSL library as performant and robust SSL engine. Due to recent security breaches in OS-level OpenSSL library distributions (e.g. the Debian OpenSSL "fix") and the general problem of old OpenSSL libraries on systems, we have chosen to integrate the most current, unpatched and original versions of the OpenSSL libraries directly with the package - on Windows and all supported Unix platforms as well as Mac OS X. The current version of OpenSSL shipped with the eGenix.com pyOpenSSL Distribution can always be determined by looking at the second part of the distribution file version number, e.g. 0.8.0_0.9.8j_1 means that we have taken pyOpenSSL 0.8.0, added OpenSSL 0.9.8j and wrapped it up in distribution version 1. In some cases, we patch the included packages to work around problems. Please see the change log for details. To avoid patent issues, we have excluded the following algorithms from OpenSSL via its config options: IDEA, MDC2 and RC5. We also removed the Kerberos5 support, since it's not needed for SSL-based communication. Supports Python 2.3 - 2.6. When using Python 2.5 or later, there are no additional requirements. Python 2.3 and 2.4 on Windows also work out of the box with the installers we provide. If you are using Python 2.3 or 2.4 on Unix, you additionally need the current eGenix.com mx Base Distribution installed (>= version 3.1.0), since this is needed to be able to load the shared OpenSSL libraries directly from the package directory. The source distribution includes pre-compiled versions of the OpenSSL libs and header files for Windows - compiled with VC6 for Python 2.3, VC7 for Python 2.4 and 2.5 and VC9 for Python 2.6 and later. Please see the openssl-win32/ directory for details and the scripts we used to build those binaries. OpenSSL which is licensed under the OpenSSL Toolkit License. Please see our eGenix.com Third-Party License Guide 1.0 for details or check the source code distribution which comes with all licenses and disclaimers. The documentation for pyOpenSSL is available from the pyOpenSSL web-site. The manual includes a reference of the available programming interfaces. All APIs live in the top-level OpenSSL Python package. OpenSSL does not support sharing connections between threads. If you do, you are likely going to cause OpenSSL and thus pyOpenSSL to get into an unstable state which could result in anything from lost data to corrupted data and in some situations even lead to segfaults. If you are using Python 2.3 or 2.4 on Unix, you also need to install the current eGenix.com mx Base Distribution (>= version 3.1.0). This is not needed for Python 2.5 or later version. Note: Even though the files for Python 2.3 and 2.4 are named "...Power_Macintosh..." or "...ppc...", they still contain universal binaries. The name is due to a bug in distutils for Python 2.3 and 2.4.